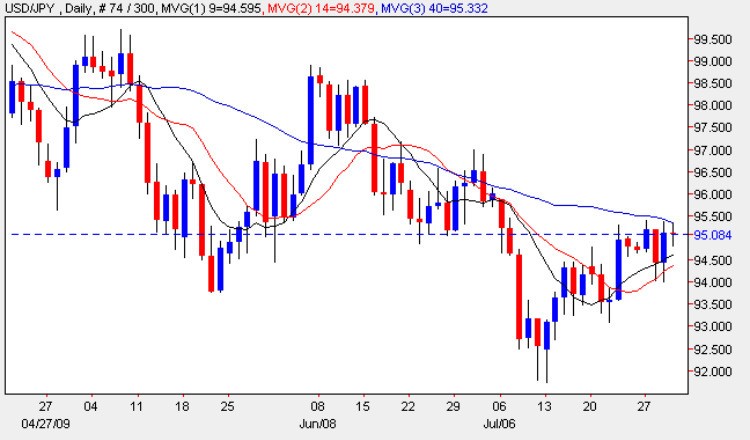 The yen to dollar pair continued to move sideways yesterday ( just for a change) closing the session with an up candle this time, which reversed the losses of Tuesday and reinforcing the lack of direction so prevalent in the last few months. It is interesting to note however that the 95.50 seems to be the stumbling block to any short term move higher, which is also being helped by the 40 day moving average which is adding to this technical barrier. This level is also the start of the deep congestion above, so with these three factors combining, this may prove to be the turning point to a deeper move lower in due course. If and until this happens we will have to wait, and I for my own trading I am avoiding this pair at present until we see some clearly defined signals and a break below the 92 price point. The only fundamental news overnight for the Japanese Yen was the Preliminary Industrial Production figures which came in marginally worse than expected at 2.4% against a forecast of 2.5%. Whilst this was below expectation it was the fourth straight month that industrial output has risen, as exports get support from a gradual pickup in global demand led by stimulus spending across the world. There are two versions of this indicator released about 15 days apart – the first is the one last night, which is then followed by the Revised, and of the two last night’s figures tend to have the most impact. This is generally considered a leading indicator for the Japanese economy as a whole given it’s preeminence as one of the worlds largest exporters. The fundamental news for the US is limited to the weekly Unemployment claims, so once again I suspect we will see little movement in the USD/JPY pair as they continue their inexorable move sideways price action for another day.